At the start of the programme, Cuba presented several modern contemporary dances which had a hint of hip hop. 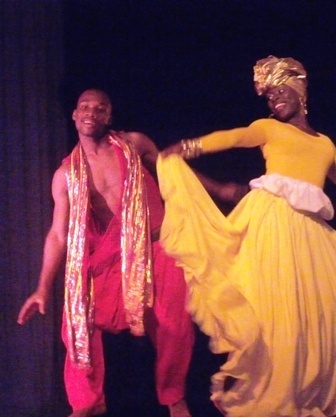 The dim lights in the theatre set the atmosphere of mystery for the Cuban segment while the bright and colourful lights set the scene for joyful play as the Guyanese took the stage. The Guyanese dancers which included performers from the National Dance Company, Classique and Nitrageet performed items depicting Guyana’s cultural heritage. The pieces were put together by Vivian Daniels, Linda Griffith, Kijana Lewis and Dr. Seeta Shaw-Roath. Following the exhilarating performance by the Guyanese contingent, the Surinamese brought down the curtains with presentations from the Javanese, Chinese and Indian groups.